A parliamentary report of 1777 recorded parish workhouses in operation at at Pewsey for up to 100 inmates and at Burbage for up to 18 inmates. County of Wiltshire: Alton Priors, Burbage (2), Charlton, Collingbourne Ducis, Collingbourne Kingston, Easton, Enford, Everleigh, Fittleton, Huish, Manningford Abbots, Manningford Bohune, Manningford Bruce, Milton Lilbourne, Netheravon, North Newnton, Pewsey (2), Rushall, Upavon, Wilcot, Wilsford, Woodborough, Wootton Rivers. Later Additions (from 1880): Chute, Chute Forest, Ludgershall, North Tidworth. The population falling within the union at the 1831 census had been 11,674 with parishes ranging in size from from Manningford Abbots (population 165) to Pewsey itself (1,588). The average annual poor-rate expenditure for the period 1833-35 had been £8,415 or 14s.5d. per head of the population. 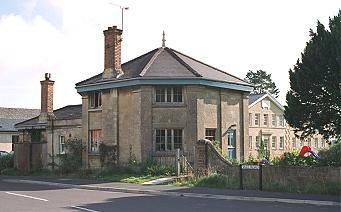 Pewsey Union workhouse was erected in 1836 on a site at the west of Pewsey. The Poor Law Commissioners authorised an expenditure of £3,213 on construction of the building which was to accommodate 200 inmates. It was designed by William Cooper, who was also the architect of the nearby Marlborough Union workhouse. His design for Pewsey was based on the Commissioners' model cruciform or "square" plan published in 1835. It included an entrance and administration block behind which further accommodation ranges radiated from a central octagonal hub to create separate exercise yards for the different classes of inmate (infirm/able-bodied, male/female). The site location and layout are shown on the 1923 map below. The entrance range lies to the south of the site, with the chapel to its east. Pewsey entrance block and chapel from the south, 2000. 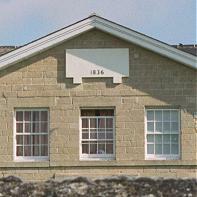 Above the entrance doorway, now converted to a window, a plaque bears displays the date 1836 — the words Pewsey Union Workhouse have been obliterated. To the west of the entrance block is the porter's lodge. The main workhouse accommodation was in the four wings radiating from the central octagonal hub. Pewsey workhouse from the north east, 2000. In the 1930s, Pewsey became Wiltshire's major "industrial colony for mental defectives". These were housed in a number of villas to the north of the workhouse. Pewsey villa for "mental defectives", 2000. From 1948, the institution was renamed Pewsey Hospital. The site has now been largely redeveloped for housing. Wiltshire and Swindon Archives, Wiltshire and Swindon History Centre, Cocklebury Road, Chippenham SN15 3QN. Relatively few records survive. Holdings include: Guardians' minutes (1913-30); Relief report books (1926-30).